← Useful links about Windows Failover Clustering. 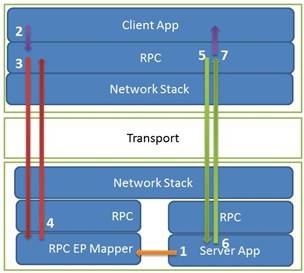 The diagram below shows the RPC workflow starting with the registration of the server application with the RPC Endpoint Mapper (EPM) in step 1 to the passing of data from the RPC client to the client application in step 7. Have you set static port on the DC for netlogon or for any other interfaces? Use the script https://gallery.technet.microsoft.com/Test-RPC-Testing-RPC-4396fcda that helps to test the RPC connectivity via TCP: This script tests TCP network connectivity to not just the RPC Endpoint Mapper on port 135, but it also checks TCP network connectivity to each of the registered endpoints returned by querying the EPM. Many firewall teams have a difficult time with RPC, and they will end up allowing the Endpoint Mapper on port 135, but forget to also allow the ephemeral ports through the firewall. This script uses localhost by default, but obviously you can specify a remote machine name or IP address to test a server across the network. The script works by P/Invoking functions exported from rpcrt4.dll to get an enumeration of registered endpoints from the endpoint mapper, so it’s not just a wrapper around portqry.exe. One of the issue if the ephemeral ports are blocked between clients and the domain controller it will show the RPC error while trying to join a client machine to the domain. Client gets joined to the domain and later fails with error “Changing the Primary Domain DNS name of this computer to “” failed. The name will remain “testlab.com. The error was: The RPC server is unavailable”. use the below link to make sure we opened the required ports for the communication between clients and the DC. This entry was posted in Windows and tagged RPC, RPC error, The RPC server is unavailable. Bookmark the permalink.